Though it's still over a month away, Thanksgiving is around the corner, and as with any big family celebration, you never know what will happen. Of course, everyone is entitled to differing views and political leanings, but when it comes to the dinner table, these should all be politely left at the door. So what do you talk about when many of these popular topics could cause conflict when you’re trying to keep the peace? Let’s be honest, the weather is not an option. Thankfully, we prepared a few conversation starters to steer table talk in a safe direction since you never know who you’ll end up sitting next to at dinner, especially if there’s a seating chart. To avoid awkward silence and ensure that the holiday goes off without a hitch, think of a few positive subjects to discuss that go beyond commenting on the weather. Need ideas? Here are 32 party conversation starters to get you through the holiday season and beyond. If you're looking to steer off sensitive topics with relatives, turn to travel. Whether you're asking your cousin where they traveled this year or you want to know what your family has planned travel-wise for the coming year, topics around wanderlust will always get people talking. What are your vacation plans for the holidays? What’s on your bucket list in 2018? Why do you want to go there? Have you done any short weekend getaways recently? I’d love some recommendations. Do you prefer a summer or winter vacation? What’s the most amazing hotel you’ve stayed at? What’s the best travel experience you’ve ever had? What’s the most beautiful beach you’ve ever visited in the world? Have you always wondered how your grandparents met? Maybe you'd like some relationship advice from your aunts and uncles who have had a successful marriage? Or perhaps you're looking to find out all about your sibling's new flame—relationships always seem to spark conversation. Ask the longest-married couple at the table to tell the story of their wedding day. Do you think that telling the truth is always right—even when someone gets hurt? Tell a fun and hysterical story about the person to your right. Ask the parents at the table to describe what happened on the days their children were born. What’s the best surprise that you’ve ever received? 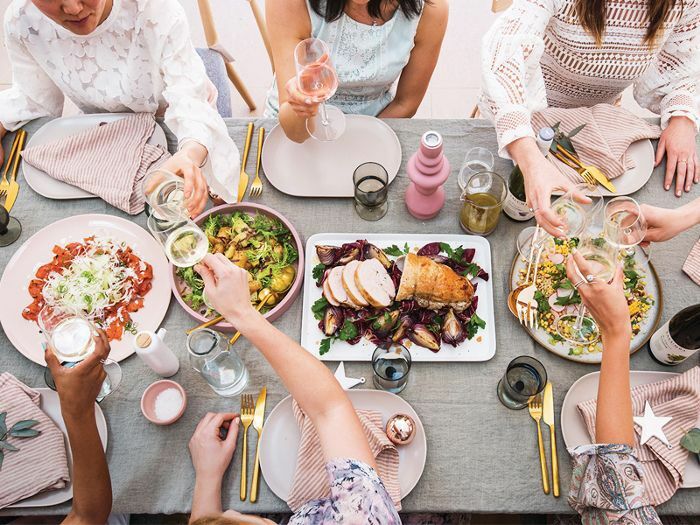 We all tend to indulge over the holidays and end up feeling burned out by the end of the year—which makes Thanksgiving the perfect time to ask your family or colleagues what they do to stay fit, healthy, and calm. Whether you're asking them about the latest wellness trend or the workout they swear by, chances are you'll have something to talk about for hours. Have you ever tried sage smudging? I’m really into [new fitness class]. Have you done it before? Have you ever tried eliminating alcohol from your diet for Feb Fast? Would you do it? Have you read The Life-Changing Magic of Tidying Up? Did it help you organize your home? What’s the craziest wellness trend you’ve tried? Did it work? Who doesn't love to share their favorite restaurant or recipe? Talk to people about food, and you'll likely have them hooked for a while. Whether you're asking them for cheese recommendations or about the best dish they've tried recently, food is a topic that never fails to get people talking. What’s your favorite part of the Thanksgiving meal? What was your most memorable meal of the year? What’s the best restaurant you’ve ever been to? What’s the strangest thing you’ve ever eaten? What is your favorite kind of cheese? What’s your favorite recipe book and why? If you're feeling stuck in your career or you simply want advice from your elders, Thanksgiving is the perfect time to talk to family, friends, and colleagues about their professional paths—ask them about a career milestone or about a new business venture you're considering, or ask them about how they've overcome certain challenges in their professional paths. Chances are you'll both come out of the conversation wiser. If you could have any job in the world, what would you do? Ask older family members to describe their first jobs. Did someone at the table experience a career milestone this year, such as starting a new job, graduating, or receiving a promotion? Ask them to share how it’s going. What’s your passion? Would you ever want to turn it into a business? Do you agree with the quote “find something you love and turn it into your job”? Above all, the one thing that never fails to get people talking is a shared love for the latest hit TV show, movie, or book. If you're stuck in an awkward silence, ask your family or colleagues about the best TV show they've binge-watched recently, or the latest book they've devoured. You'll even have something to watch and read once the holiday break comes around. Black Friday: yea or nay? The finale of Stranger Things (or a cult show you watch). Discuss. What show are you most excited about right now? Where were you when [insert topical event] happened? How did you celebrate last Thanksgiving? What holiday movie are you looking forward to seeing? What are you most thankful for? This post was originally published on November 23, 2016, and has since been updated.